Context: First fiction I’ve borrowed from a British library in well over a decade. Got this one the day I joined Bar Hill library. This is the story of what happens when an event is allowed to settle into one’s memory so deeply that, in time, it stains one’s entire being. It’s evocatively written and asks deep philosophical questions about the nature of relationships. The opening line is a metaphor for the book. The two casks of wine represent two men who grow up as inseparable friends until an event as subtle as silence severs them from one another. Forty-one years later, they meet again and questions are asked. Although the book was well-written, I found some details a little frustrating. One character seems to hail from Poland, has settled in Britain after a lengthy spell in the tropics and is named Konrad. Why so? Is it supposed to be biographical at all? I was frustrated also with the lack of balance between the two characters. I felt that the general dominated the book to such an extent that Konrad and any other character was overshadowed. Perhaps that was the intent. And the event that generates the title of the book was the most frustrating to me. But this was unquestionably intentional. It’s a very short book and so an easy read. Don’t let that fool you though, it’s no poolside yarn. There are serious issues in this novella. If you come across it, I’d recommend picking it up and reflecting on it. In the morning, the old general spent a considerable time in the wine cellars with his winegrower inspecting two casks of wine that had begun to ferment. But, like every kiss, this one is an answer, a clumsy but tender answer to a question that eludes the power of language. 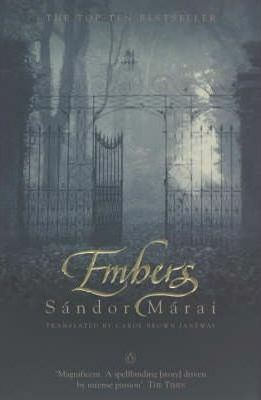 I have just recently read Embers although my reaction was one of boredom but as it is on the 1001BYMRBYD List and one of my reading challenges I did perservere with it being only a slim novel. I did enjoy the language style as it is quite beautiful but there was a tendency for the story to meander aimlessly at times and the longwinded meditations became so repititious. BTW I love your how you include the context of your reading in your reviews . They are great and enjoy keeping track of your reading life. thanks so much for your comment Jenny and the kind words about the context. It’s as much for me to keep track and remenisce as it is for my reading faithful to follow!